Mosaic provides the ability to create organizational keywords, known as ‘taxonomy terms’, which are grouped into ‘Taxonomies’. These terms offer a secondary way (after content types) to connect, relate and classify your website’s content, which cuts across the content structure imposed by content types. The Taxonomies configuration options allow you to create, manage and apply taxonomies to content on your site. Taxonomies allow you to tag content with terms which enable users to filter for content both across and within content types. Taxonomies are useful for displaying specific content based on taxonomy terms. The screenshot below displays the output of a 'taxonomy term page' on a Mosaic website. The page displays all content on the site that has been tagged with the 'Modern and Contemporary' taxonomy term (2), which exists within a taxonomy entitled 'Research Period' (1) (this page is an in-built page type in Mosaic and can be found by clicking on a taxonomy term link listed within a ‘Taxonomy terms display’ widget). The results output to the page displays breaks the tagged content down by content type, i.e. Article content (3), People content (4), and Event content (5). See 'Overview of taxonomy implementation and usage' for information about using taxonomies with filtered content. Taxonomies are most commonly employed to allow users to filter for content either within or across content types. To enable this, three things need to be implemented: set up a taxonomy and create taxonomy terms that are relevant to the content; apply a term/terms to the content; and create a Grid or List listing on a page which provides the ability to filter listed content by taxonomy term. Below is an overview of the end-to-end implementation and usage of taxonomies. *Grid and List listing widgets are new widget styles. As of January 2018, they will be released to all Mosaic websites. This implementation guide is also relevant to legacy listing widgets (i.e. Article, Event, Page, and Person listing widgets). Taxonomies can be created, edited, and deleted on Mosaic sites using the controls in the Taxonomy administration screen. The display of items on the taxonomy term display page can be configured on the Taxonomies screen. Use the checkbox on the Taxonomies screen to choose whether or not the taxonomy title, e.g. 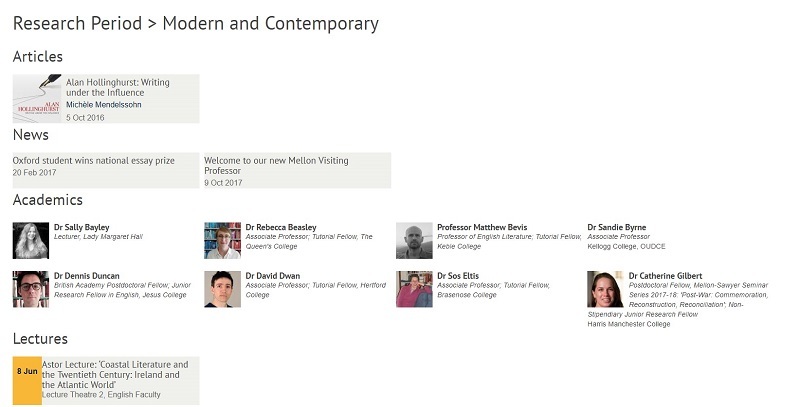 'Research Period' in the screenshot above, is displayed on the taxonomy term page. Use the display style configuration options on the Taxonomies screen to configure which item style is used for the display of content listed on the terms page.